The California based personal lifestyle gadget brand introduces the best in class range of personal gadgets with the latest generation X speaker. SoundBot launched its latest Bluetooth Wireless Speaker – SB 574 designed for the music lovers and youth across the world. The speaker gives the listener clear dynamic full range music on a 6W HD Bluetooth speaker with premium drivers and it is the perfect speaker for music enthusiasts who want exhilarating sound quality for incredible listening experience. With cutting edge technology, subtle grey colour and minimalist grill design it is ideal for today’s millennial and partygoers. The speaker is easy to carry and is designed to take your love and passion for music to a new paradigm. This gadget can synchronize with any device such as the iPad, iPhone, Android and MP3 and MP4 as well. The SB574 speaker is a great gadget to carry on the go and it allows instant streaming combining SoundBot’s high-quality music dynamics and engineering. The colour of the speaker is uniquely rich and it comes in a dark grey shade with a premium range fabric grill giving it an elegant finish. Its features are great for any terrain and atmosphere including parties and for personal use. The SoundBot SB 574 comes with a Passive Radiator Subwoofer and a large speaker cavity with improved range of 33 feet. Built in with an HD3 watt loud deep bass and premium drivers it produces perfect listening quality for excellent sound effect. ‘We are a technology company in the personal gadgets segment and this is a speaker which is apt for various kinds of activities. It is one of the best in class speakers with a unique design element matching with the modern and minimalist era in music and fashion which becoming a fusion in the realm of recent lifestyle changes. Our incredible sound quality, engineering, and design is focused in the unique and elegant speaker that gives the audiophiles extraordinary sound quality catering to every user demands both indoors and outdoors. The speaker offers a multifaceted media connectivity via Bluetooth and it comes in a dark grey colour with a special fabric grill design that’s important for today’s fashion-conscious generation X.’ Commented Mr. Rajesh Bansal, Director, SoundBot. 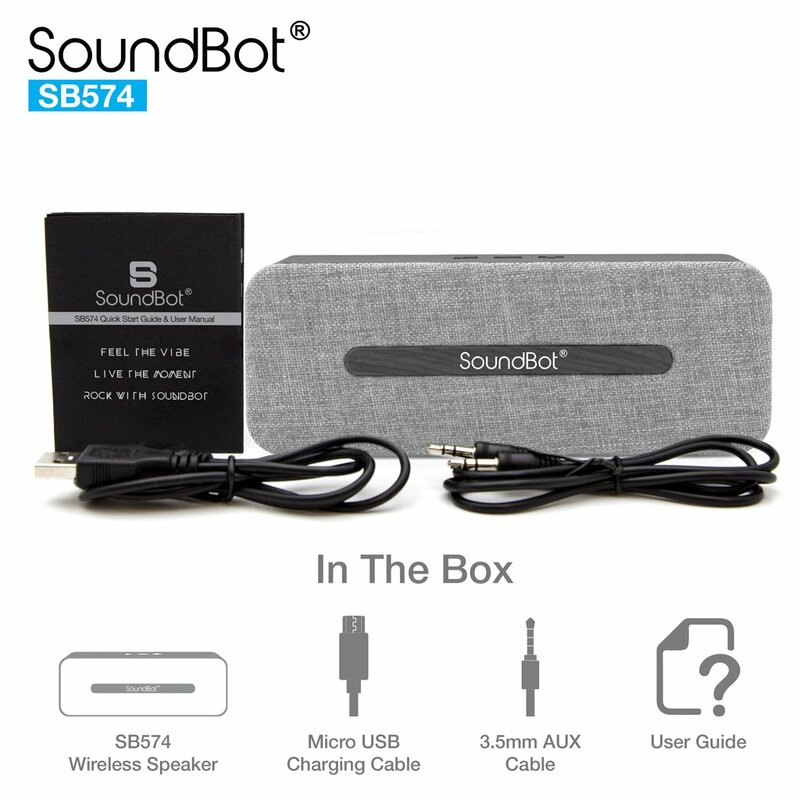 SoundBot SB 574 features are multi variant, as it connects to all media devices, allowing the users to get up to 6 hours of playback time, along with a built-in 3.5mm aux port which connects with or without Bluetooth.